Love. It transcends human differences and brings people together in ecstasy and in agony. It’s the reason for wars and surrenders, the subject of poems, books, songs, plays, films and of course, art. 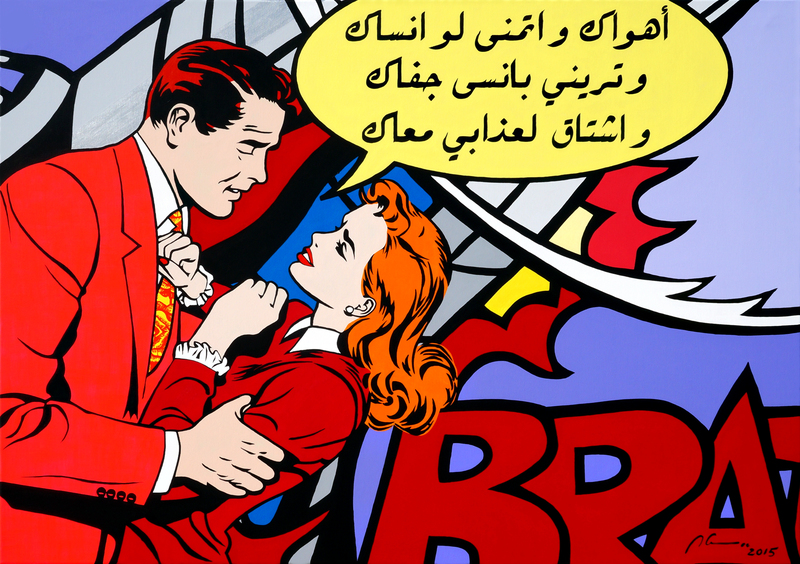 In his latest series of pop-art paintings, “Chagrin d’amour – The Musical”, Marwan Chamaa depicts moments in the timeline of a love affair, illustrating ups and downs with mostly primary colors, defining pleasures and pains with a vintage comic-book aesthetic. 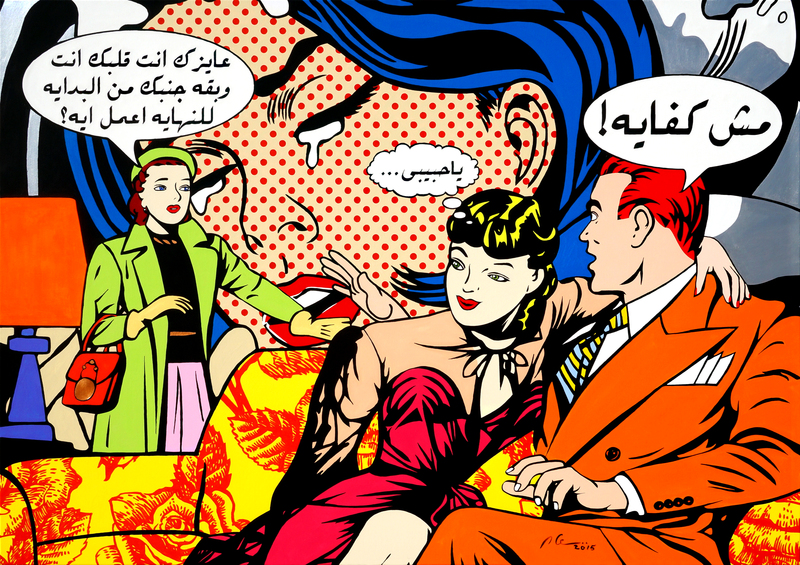 The six large, vibrant works weave together a harmonious melange of renowned paintings – mostly those of pop-artist Roy Lichtenstein and comic magazine illustrations – with the heartfelt love song lyrics of Arabic tarab music of the 1940s – 60s. It’s no wonder the impressive artworks caught the eye of organizers at the prestigious Opera Gallery in Dubai, where he has an exhibition in April. Love stories never get old because everyone can relate and they’re fantastically melodramatic explains Chamaa. 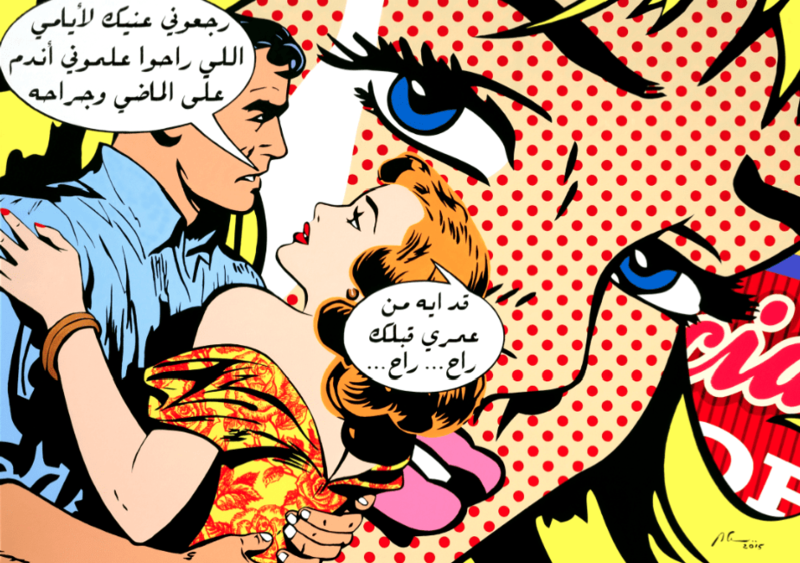 In these artworks the dialogue is distilled from songs by Um Kulthum, Asmahan, Abdel Halim Hafez and Farid el-Atrash, “stressing on the beauty of the poetry of Arabic songs,” he says, from the infatuated lyrics of “I Love You” (Ahwak); the begging in “One Thousand and One Nights” for the sun not to rise for a year; or the intense demand for freedom of “The Ruins.” Looking closely at details, discerning viewers will also notice the famous Velvet Underground banana by Andy Warhol on a tissue packet and Keith Herring’s “Barking Dog” in the background. With every painting, looks of love and amorous verses reveal passion and heartache that transcend language and land, but should not be reduced to a simplistic East meets West analysis. 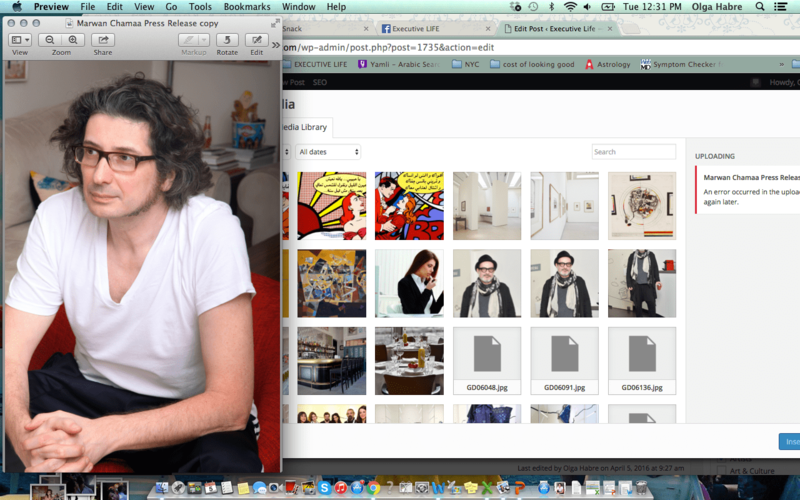 Chamaa is quick to dismiss labels in general, like his art being “pop” or his nationality “Lebanese”. The artist, whose career has spanned over 30 years, was born in Beirut but largely grew up in Germany and spent some time in the United States before returning to Lebanon. His paintings tell stories, says Chamaa, who prefers to create thematic series rather than individual pieces. His previous “La Dolce Vita” series, shown in 2013 at Lebanon’s Galerie Tanit and at the Bel Air Fine Art Gallery in Geneva, paints a melodramatic, consumerist love triangle between beautiful Yasmine, her sleazy but rich new boyfriend and her lovelorn neighbor. The 12 canvases are a continuum spanning 22 meters and conclude with a follow-up painting entitled “Caramel, Superheroes, Fried Eggs et Chocolats.” But his art doesn’t always evoke drama; a more recent work titled “Mashrou’ Lulu” – a play on Lebanese band Mashrou’ Leila – is a light and fun triptych of comic book character Little Lulu, who features a lot in his projects, cooking a giant plate of spaghetti. 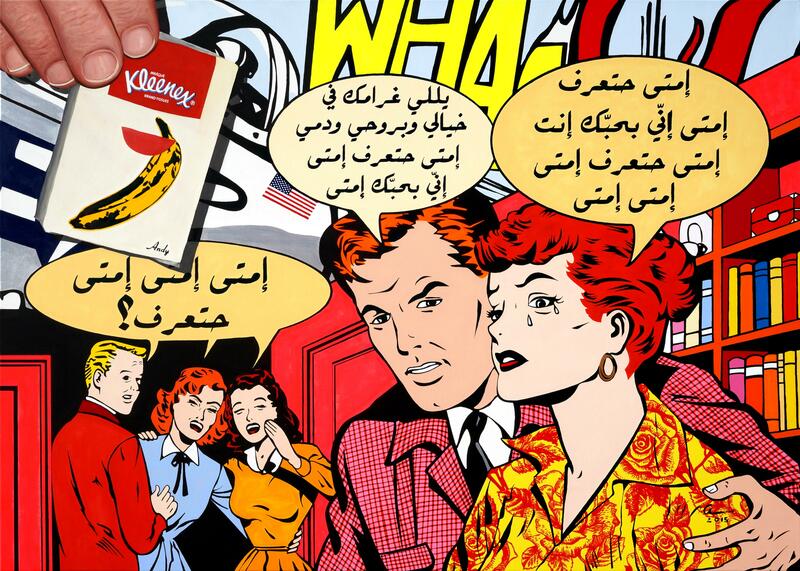 Chamaa’s signature style often intertwines Arabic script with more traditional pop art and regularly includes collage-style images of famous products, logos, characters and symbols. It’s not surprising then, that the artist has a background in graphic and advertising design – even setting up his own boutique design company fresh out of college in the 1980s. Before 2010 his painting style was actually very different but the shift was natural. “Pop art glorifies commercial products so while my jump from advertising to pop art took time, it makes perfect sense,” he says. In between stories, Chamaa tells jokes and makes sarcastic comments, recalling how he grew up surrounded by culture in a family of creatives and was first encouraged to pursue art by a primary school teacher in Germany. Chamaa also studied fine art and, although he had a long-term day job, he always kept an easel at the office. He never thought he’d earn a living through art, but since he entered early retirement in 2006 to become a stay-at-home-dad, he began to have more time for his passion. When his daughter went to school and he began to experiment with pop-art, a friend pushed him to “come out of the closet” as an artist. But dealing with logistics is far from enjoyable for Chamaa, which is why he now has an agent. “The business side of art is like any other business,” he says. “It’s boring and you cannot really do both. If you really want to take it seriously you have to focus on your art; you can’t think about how to transport paintings,” he explains. His exhibition at the Opera Gallery is ideal for regional exposure, which he says is essential for his career. First founded in Paris in 1994, the leading contemporary art gallery operates out of 11 major cities, also opening in Downtown Beirut last year. Chamaa welcomes publicity but also criticism. “I want people to criticize me, to say ‘who does he think he is?’ and ‘my kids can draw better!’ I want to hear these things,” he says. “Chagrin d’amour – The Musical” premieres at the Opera Gallery in Dubai’s DIFC area on April 1st and runs for two weeks.